Today's post is...shh... a shopping tip between you and me :). 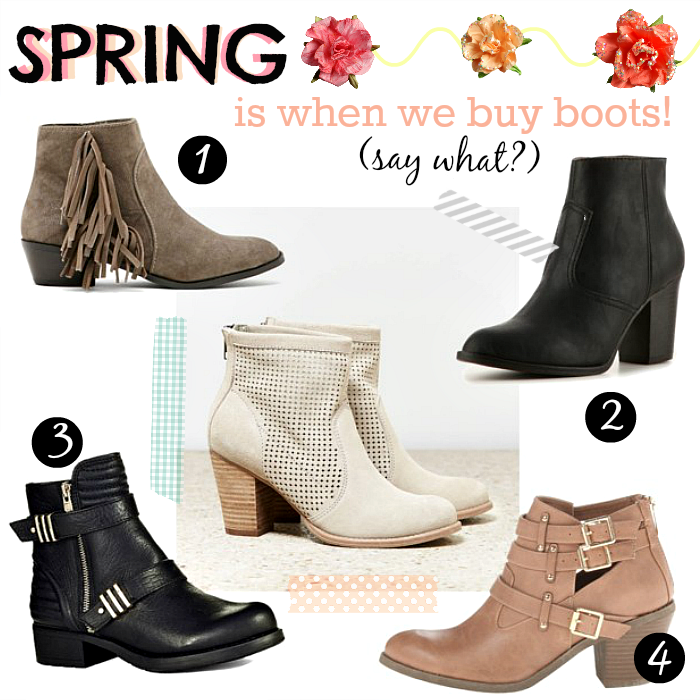 In the Spring, stores want to get rid of their winter and fall shoe inventory. It makes sense...no one wants to wear boots in 90 degree weather! So if you've been drooling over a pair of boots all winter long from a really big brand...guess what? Now is the time to get it! Get the high end leather, buckles and accents you crave for a price that won't hurt your savings. Here are some high brand boots that are have great discounts right now! I have a bunch more below as well for you to browse through. I just bought a pair of Steve Madden Partenon boots for something like $34 the other day at Lord & Taylor. Normally $100! I almost fainted when I saw that price. Let me know if you get any great deals on winter boots! I'd love to hear! Sorry to sound like the biggest broken record ever but thank you so much to all of my new followers! It means a lot to me! Especially the comments I've been getting lately! Thanks for your wonderful comments guys!